In my two previous Bulletin posts, I discussed the efforts of prominent Nazi intellectuals (such as Gerhard Kittel and Alfred Rosenberg) who, during the 1930s, worked to buttress the German Reich through the appropriation of Christian symbols, images, and narratives. It is worth noting that Rosenberg and Kittel offered competing presentations of a Nazi Jesus and a Nazi Christianity, each of which was intended to unify the German churches and people. For Kittel, this meant the wholesale separation of Judaism and Christianity in hopes of persuading fellow Nazis that the Christian narrative was ideologically compatible with larger Nazi social projects. For Rosenberg, it meant reclaiming the image of Jesus as an Aryan warrior-chief in the age-old battle against Judaism. 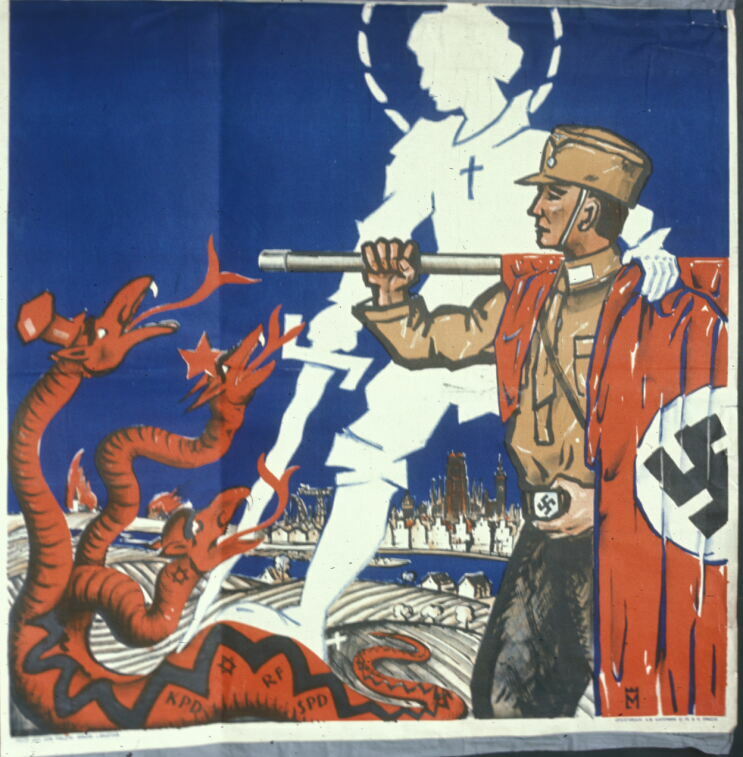 This present post looks at yet another attempted Nazi Christianity, so-called “Positive Christianity” in the discourse of the NSDAP (The National Socialist German Worker’s Party). This somewhat amorphous sense of religious community was defined primarily by its struggle against the perceived threat that German Jews were said to represent, and its concurrent desire to protect “the moral senses of the Germanic Race.” It resisted any absolute expression of institutional form… or rather had too many institutions vying to represent it. In the nascent years of the NSDAP, the party offered a synthesis of various Christian ideologies, nationalistic loyalties, and racial/cultural investments, and honed in on the characteristics and beliefs which many at the time shared, such as a belief that Jesus was not Jewish, a desire to define Christianity in opposition to Judaism, a hope for a unified and empowered Germany, and an antagonism towards Capitalism, liberalism, Marxism, and secularism. For example, the Winter Relief Program (Winterhilfswerk), while not an innovation of the Nazi Party, quickly became an institutionalized part of its public outreach. With unemployment and poverty high, this program clothed, warmed (via coal and fire wood), fed, and employed many destitute Germans (in the winter months) from 1933 until the regime’s demise in 1945. Public funding of this program was ‘voluntary,’ although intimidation and shaming tactics were utilized to bolster funds. The program was also local in nature… meant to be reminiscent of the Germanic clan ideal. According to Thomas E. de Witt’s article, “The Struggle Against Hunger and Cold”: Winter Relief in Nazi Germany, 1933-1939, the first winter program received support from 1.5 million volunteers. For Hitler, the purpose of the Winter Relief Program was to create solidarity between fellow Germans as well as assist the needy, and it appealed to many German Christians who saw it as their duty as Christians and Germans to help their fellow man. How could such a program, which appeared to engender a type of Christian brotherhood, be driven by such a ruthless regime? The answer rests in the concept of categories: for these Nazi Christians, Jews and other ‘deviant’ groups were not categorized by the Nazis as ‘brothers.’ Even Jewish coverts to Christianity were seen as problematic because for the Nazis being Jewish, just like being German, was about blood not about religious choice. What is unclear is precisely how much social and ideological force Nazi Christianity, as opposed to welfare programs like that discussed above, actually exerted. Susannah Heschel’s book, Aryan Jesus, describes the anti-Semitism in the German churches as “the glue that united the otherwise warring factions” (7). She argues that Nazi ideology represented “a colonization of Christian theology,” one which utilized Christian anti-Semitism for its own purposes (8). Luther had already planted anti-Jewish ‘seeds’ in the church… the economic and social repercussions of the Versailles treaty simply cultivated the growth of anti-liberal, anti-Jewish, German nationalism. Thus, racializing processes had been set in place centuries before the Nazis came to power, and some scholars have suggested that it was not merely coincidence that Kristallnacht fell on Martin Luther’s birthday. This entry was posted in Kate Daley-Bailey, Politics and Religion and tagged Christianity, Kittle, Nazi Germany, positive and active Christianity, Rosenberg. Bookmark the permalink. Kate, can you link to your previous articles so that we can read them if we missed them? I just realized that my article refers to Heschel as ‘he’ and this should be ‘she.’ Sorry for the confusion and thank you for reading! And speaking of gender confusion, was this article written by ‘he’ (Kenny Smith) or ‘she’ (Kate Dailey-Baley)?